It comes as little secret that Jane Austen is one of my favorite authors. 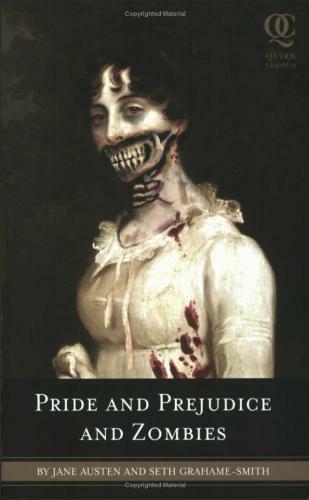 I have Persuasion and Pride and Prejudice quite nearly memorized (I’m close on Sense and Sensibility), mostly from having listened to Nadia May’s readings of them while working on my databases or driving. I have no doubt my next door neighbors were relieved when the last round of data entry was complete last fall and the calm female voice no longer hummed on for three to four hours at a time. It sounded funny and tongue in cheek, though, so I grabbed it–ahead of Oprah mentioning it and causing the library hold lists to explode. He threw in odd, sharper dialogue between the characters–particularly coming from Darcy and Mr. Bennett. These two men, for their faults of pride and lacsidasicle raising of daughters, are supposed to be gentlemen. Odd references to the sexual definition of the word “balls” (as opposed to the dancing) and rude responses jarred me out of the text. And, for me at least, it didn’t add. Fighting scenes, visually descriptive enough scenes of people being eaten by zombies that I wouldn’t want to read this and eat spaghetti at the same time–those worked and were interesting. While most of the characters needed to survive (won’t work if Darcy is the living dead), Mr. Grahame-Smith found a way to kill one of the characters off who survives the original. Overall–mixed feelings. It was interesting and made the girls a little more active than just five young ladies seeking husbands but I definitely found elements of the change distracting and contextually jarring (moreso than the dead crawling out of their graves and eating people’s brains even).